Firefighters look at the grey 2007 Buick Century, of which they had just extricated a man from, with help of the jaws of life. 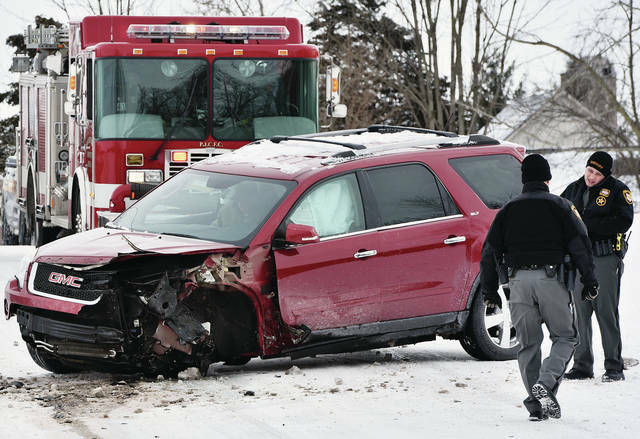 The vehicle collided with a red 2012 GMC Arcadia SUV on the 16000 block of East Mason Road, north of Sidney, at 10:42 a.m. Tuesday, Jan. 22. Sidney and Port Jefferson firefighters responded. The Shelby County Sheriff’s Office is investigating the crash. The left front tire of a a red 2012 GMC Arcadia SUV was torn off in a collision with a grey 2007 Buick Century on the 16000 block of East Mason Road north of Sidney at 10:42 a.m. Tuesday, Jan. 22. Sidney and Port Jefferson firefighters responded. The Shelby County Sheriff’s Office is investigating the crash. -12:38 p.m.: vandalism. Deputies were dispatched to 5523 State Route 29 on the report a vehicle damaged the yard. -5:42 a.m.: property damage crash. 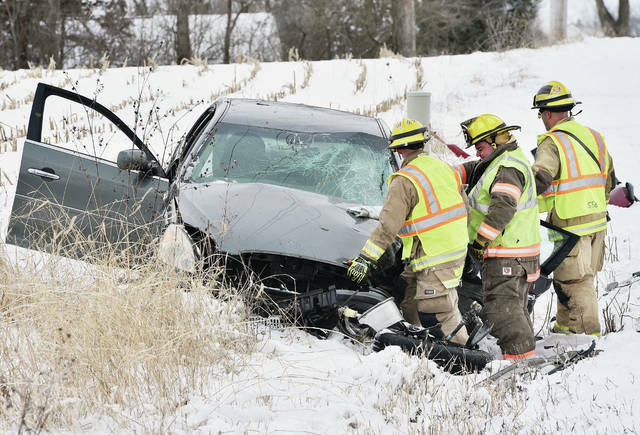 Deputies were dispatched to the 13000 block of Meranda Road in Franklin Township on a report a vehicle slid off the road and struck a guide wire. -7:25 a.m.: vehicle in a ditch. Deputies responded to a report of a vehicle in a ditch. -4:50 to 11:45 p.m.: vehicle in a ditch. Deputies responded to 15 reports of vehicles in a ditch. -4:22 p.m.: forgery. Deputies were dispatched to Keith’s Truck and Trailer Inc. on state Route 47 in Cynthian Township on the report of bad checks. -3:54 p.m.: property damage crash. Deputies were dispatched to the 16000 block of state Route 274 in Dinsmore Township on the report of a two-vehicle crash. -11:21 p.m.: property damage crash. Fort Loramie Police responded to Eilerman Road at Fort Loramie Swanders Road in McLean Township on the report of a crash into a stop sign. -4:25 p.m.: vehicle in a ditch. Fort Loramie Police responded to a report of a vehicle in a ditch. The Shelby County Sheriff’s Office is investigating a head-on crash in the 16000 block of Mason Road in Salem Township on Tuesday at 10:42 a.m.
Terry Edgar Richardson, 76, 17787 Mason Road, Sidney, was operating a red 2012 GMC Arcadia eastbound going up the west side of a hill in the 16000 block of Mason Road. Denny Ray Lambdin, 53, 9730 Pasco Montra Road, Sidney, was operating a grey 2007 Buick Century westbound, just over the crest of a hilly section of Mason Road, when he and Richardson struck the left front to the left front of each other’s vehicles. According to the crash report, Mason Road was completely ice-covered and had a light dusting of blown snow onto the surface. The report notes the ice appeared to be about a half inch thick on the roadway. However, the exact location of impact was not found due to rescue activity when attending to the injured drivers and because the hot fluids leaked from the crashed vehicles and melted some of the ice. Perry Port Salem Rescue, Port Jefferson and Sidney Fire Departments and the Shelby County Sheriff’s Office responded to the scene. Richardson was transported by a private vehicle to Wilson Health. Lambdin was transported by Sidney medics to Wilson Health. -5:19 p.m.: medical. Russia Fire Department, Versailles Life Squad and Houston Rescue responded to the 200 block of Kelch Road in Loramie Township. -3:03 p.m.: medical. Russia Fire Department and Houston Rescue responded to the 1200 block of Versailles Road in Loramie Township.